In June 2016 the UN published a report known as 'Concluding Observations'. The report is about how the UK is doing at keeping the promises it made to children and young people through the UNCRC. It shows government the Right Way to make sure Children’s Rights become a reality. 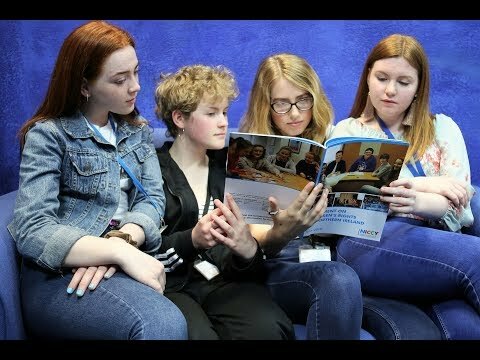 NICCY has been working with its Youth Panel to make the report easier to understand. Here on the website you will find some of the recommendations made to our Government. Each section will tell you what Rights (in the UNCRC) the recommendations refer to, and where they can be found in the Concluding Observations document. Some of the recommendations are more relevant to other parts of the UK or overseas territories, so they won’t appear in this version as the Youth Panel has tried to focus on those that apply to Northern Ireland. We have also produced a general background leaflet which you can view here. Over the coming years we will update each section with any changes Government has made, that will make sure your Rights are realised. Get in touch with our Participation Team to find out how you can get involved in making sure Government takes the Right Way to making your Rights a reality. What do the Concluding Observations Say? The United Nations (UN) is an international organisation that helps countries live together peacefully and makes sure Rights of all people are respected. They have a Committee on the Rights of the Child who are experts on Children’s Rights and they wrote the Concluding Observations. You can find out more here. The UNCRC or Convention on the Rights of the Child is an agreement signed by many countries, including the UK Government, which lists promises made to all children and young people. You can find out more here. If you want to find out more you can contact a member of the Participation team.